Last week we went a little crazy and had some fun with Jello play. It was messy & sticky and smelled amazing like only raspberry and lime gelatin can. 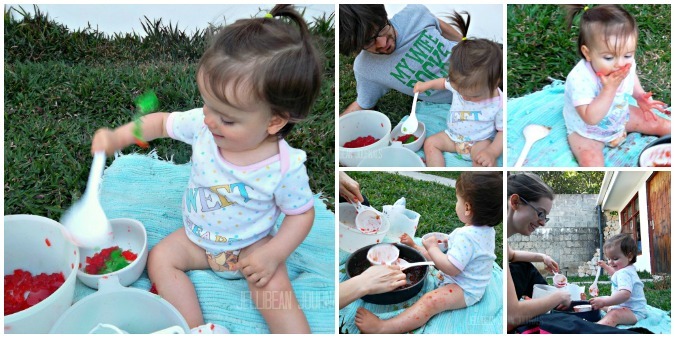 Summer Elizabeth loved playing out in the front yard scooping Jello from container to container, throwing it into the air, and squishing it around with her little toddler fingers. I liked eating it…before it was coated in grass. Amazingly enough, Summerbeth didn’t even attempt a nibble for at least 40 minutes into playtime! Add less water to gelatin than the package recommends. It’ll be sturdier for play. Use unflavored gelatin. Mix it with water & food coloring. —> No sugary stickiness! Jello play works best in messes-don’t-matter zones, like the yard or a room with tile flooring. Have damp washcloths or wet wipes on hand near the play area so you don’t have to touch doorknobs with Jello’d fingers at clean up time. Time Jello play around bathtime. That way you can just scoop up your toddler, stick him in the bathtub, and suds him right up. That looks like fun! 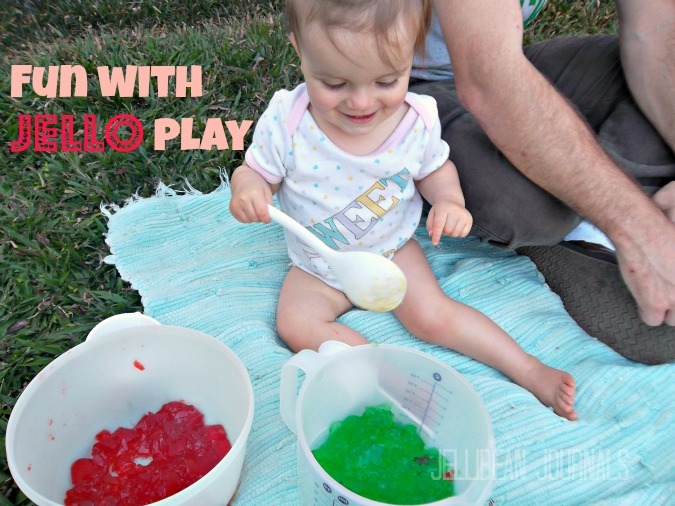 I reckon Oliver would go nuts over jello play (any excuse to make mess!) – storing this one away for summer! Great! Sure hope you remember, because this one is a whole lot of fun. It’s also a great excuse to eat a little Jello (if you don’t use the less-mess method.) Thanks for visiting, as always, Luana. I wish I had those wonderful ideas when my boys were growing! I think the jello play looks like fun! I am putting this on my list to do with Violet! Using a baby tub was my first intention, but then I realized the bowls I’d used for the Jello were too big to fit in alongside my baby. In cold climates, I’d definitely try it though. The yard just happened to be the easiest route for us. What a great idea! And pretty easy clean up! Besides wiping down the baby, clean up really isn’t too bad. It kept baby entertained a long time, so was definitely worth washing a few dishes. It’s amazing how much your little cutie looks like mom! I wanted to let you know that we have moved our blog to http://faithfulmomof9.com I hope you’ll come along with us! You know, you’re one of the only people to say Summer looks like me 😉 She is cutie, that’s all I know! Thanks for letting me know about your move. How fun!! I never thought of this when my girls were young, but I’m going to file this away for something to do with future grandkids. Grandma will be a hit!! I can not wait to try this once it gets warmer here! I just bought two books on things to do with your toddler since she’s turning one next week and I just want to keep her mind active while having fun in the process! I probably could have just scoured numerous mommy blogs for this information instead :)!!! I have seen some wonderful toddler activity link-ups that motivated me to try this. For starters, I’d recommend checking out Tuesday Tots over at Learn with Play at Home. There are some great playtime learning activities linked up there every week. Thanks for stopping by, Nicole! Thanks, Ashlee. It was really tough to choose photos for this post because between Husband and I, we practically had a 30 min. photo shoot. Thanks for stopping by today. Oh how fun! We just love Jello play. Thank you for sharing at our Pinning for Play link party!